As I mentioned in an earlier post, the Butterfly Logger now has a dynamic logging feature. This post elaborates on the benefits and costs of the feature using some data gathered during testing. Some examples of the output while using the feature is shown below in figures 1 and 2. 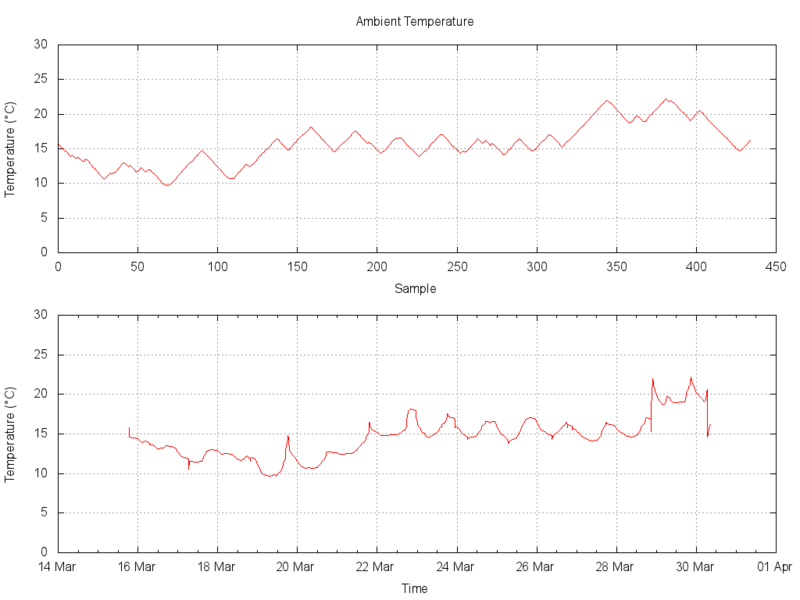 In processing the output from the logger I created a couple of scripts to analyse the data and create graphs. These are included below as listings 1 and 2. While the new feature allows us to log for longer without the risk of missing events, it also costs us in no longer being able to predict how long a logger can be deployed for in the field. Figure 1: Dynamic logging example. The two part graph shown above in figure 1 demonstrates the increasing and decreasing of logging frequency as the monitored signal changes more or less quickly. 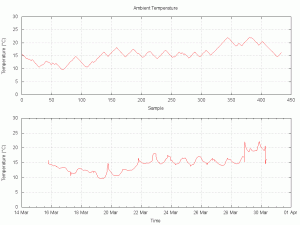 The signal being monitored in this example is the ambient temperature of my garage over a week in March 2011. This was done using the AVR Butterfly’s onboard thermistor. The temperature in the lower section is plotted as impulses simply to highlight the change in logging frequency. Figure 2: Comparison of data plotted against time or sample index. 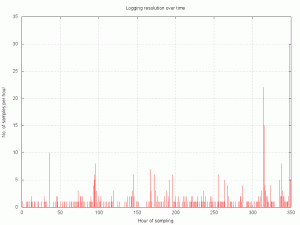 The above graph in figure 2 shows a much larger sample from the same logging session. In this plot you can again see the differences between the samples recorded in memory and the samples plotted against time. You will notice how the samples actually recorded only ever differ by a fixed amount. This is evident through the constant slope of the upper section of the graph. This constant slope, either increasing or decreasing, is an artefact of the logging threshold value. The threshold value is set at compile time in the software. The software also has a timeout parameter that establishes the maximum logging interval. If no timeout is set the system will only log when the threshold has been exceeded, however if the parameter has been set then the logger will record a sample after a fixed period time (even if the sample threshold has not been exceeded). The minimum interval is specified by the sample period parameter as used when logging in the standard mode. The timeout value is simply specified as a multiple of this interval. Figure 3: Dynamic resolution of the data expressed as number of samples per hour. Figure 3 is yet further analysis on the same data from the previous two graphs. This plot shows the logging resolution over time. The resolution is expressed as the number of samples recorded per hour. 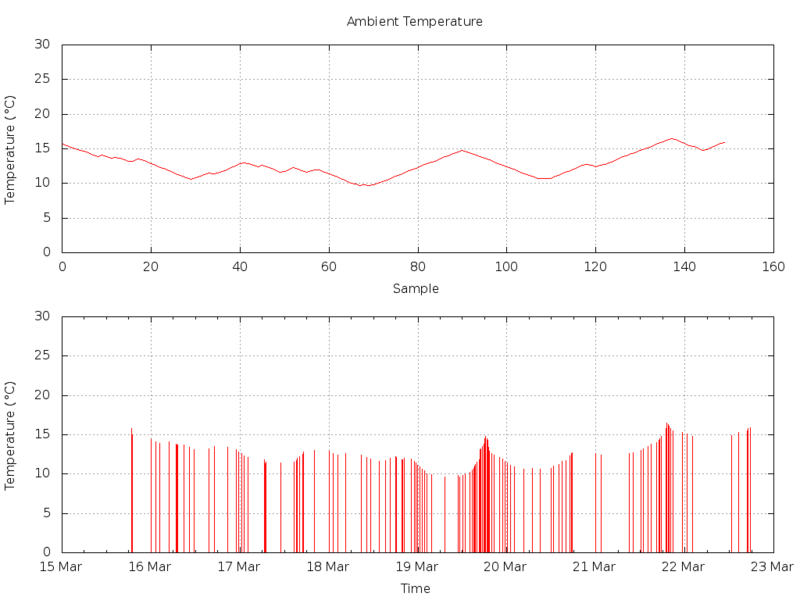 This figure was calculated by processing the data and counting the number of samples recorded that hour. Where no data is recorded for a given hour a zero is recorded. A Perl script to produce this data from the logger output is shown below in listing 2. This example gives us a good metric for measuring the effectiveness of dynamic logging. If you examine the graph you can see that, at its peak rate, the logger is recording at a resolution of 30 samples per hour. 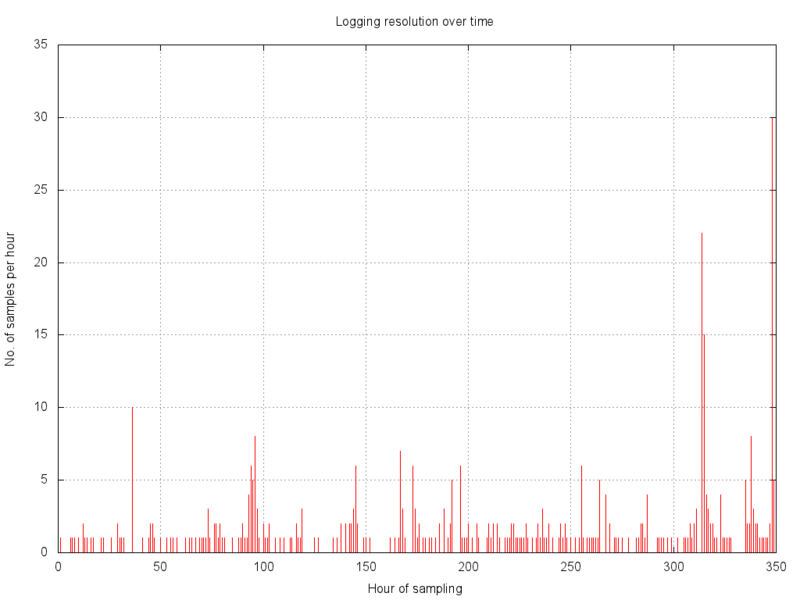 The logging interval for this session was set to once per second, giving us a maximum sample rate of 3600 samples per hour. As the rate is dynamic it makes sense to also look at the average rate over the whole period, which is just over 2 samples per hour. If we compare the average rate to the peak rate we can gauge the efficiency introduced by the dynamic logging feature. By looking at the number of samples needed at the peak sample rate and comparing this to the number of samples used, we can calculate the theoretical saving in redundant samples. If we were to capture the same data using standard methods we would have used over 14 times more samples. As our storage space is limited, if we were using a standard technique we could only log for a much shorter time. This reduction in space used can be taken advantage of in two ways. If the temperature characteristics in the garage remain unchanged the logger could record for 3 years without filling up the flash. This is much much more than possible using the standard technique. Another way to utilise this extra space would be to log more sensors over the same period as possible with standard logging. Other than storage savings the major benefit of the dynamic sample rate is that dramatic events are not missed. If we had wanted to conserve storage space using standard methods we would risk the possibility of sudden changes in the data being overlooked by a much slower sample rate. Using a dynamic rate we get the benefits of a higher sample rate without the storage cost. 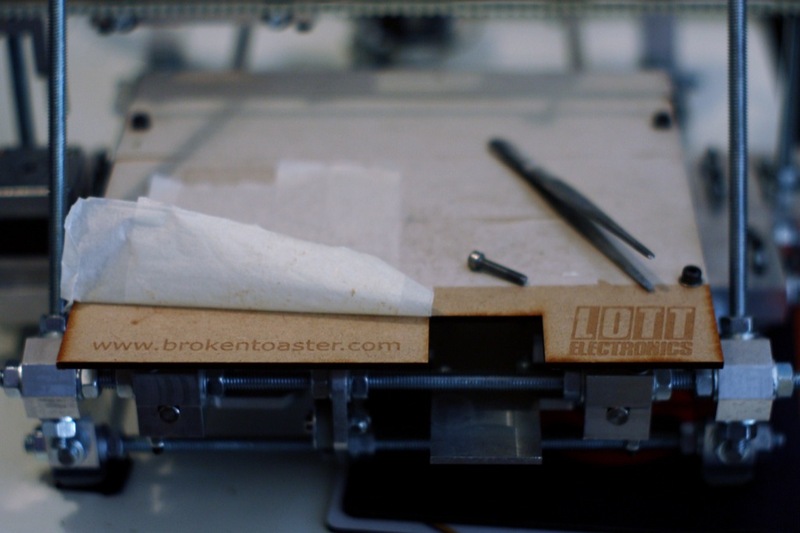 The logger will also consume more power due to being out of sleep mode more often. The logger needs to leave sleep mode often to check if it should be recording a sample to flash. Compared to just reading of the sensorsWriting to flash is by far the most power hungry activity of the logger when c, because of this I don’t anticipate the extra power requirements to be too great, although I have not actually measured the impact. When using a fixed sample rate technique you can calculate the exact length of time a logger will be able to log for prior to deployment. With the dynamic sample rate you can no longer know how long you can log for when deploying a logger. To mitigate this issue you could either make a prediction based on prior knowledge or develop a method to alert the user when the memory is approaching capacity. Using data previously gathered in an environment you can predict how long it is reasonably likely to log for. Using the example data used I would calculate the expected logging capacity based on 700 samples a week (< Doubling the average sample rate we saw in the data simply for reasons of contingency. >). Using this value would allow logging for something like 80 weeks or so. This is of course still 7 times longer than standard logging would allow. These types of calculations could potentially be incorporated to the firmware to make using dynamic logging more useful. As promised above I have included the scripts used to produce the data and graphs. They might be useful to anyone getting started with using Gnuplot, BASH and Perl to automate graphing and analysis. 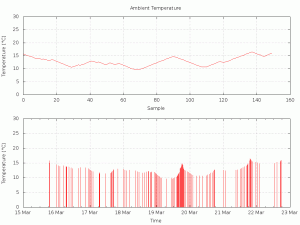 # script to plot logging results temperature against time. # the dynamic logging system. #assume arg 1 is name of file with ^M's ^D's and non data lines already removed. # 	Does not check for an entire day with out samples though. set terminal png size 1024,768 enhanced font "/Library/Fonts/Microsoft/Arial,12"
set format x "%d %b"
Listing 1: BASH script to process the data into graphs. # .. but that didn't account for hours with no samples at all. # extract the hour value from the time, ignoring the date. Listing 2: PERL script to process the data logger output and calculate the number of samples per hour.